BCHS is an open source software stack for web applications. To prepare a BCHS environment, install OpenBSD, start your editor of choice, and get to work. How does a BCHS system look? See a trivial example. New: looking to hire BCHS developers? Try BSDjobs.com. why bchs? because the open internet is inhospitable. OpenBSD. World-renowned for its focus on security and documentation. Reliable six-month releases. Binary patching. It takes the guess-work out of your environment. Resources: man pages, FAQ, Absolute OpenBSD, mailing lists. C is a straightforward, non-mustachioed language. It has full access to the kernel's system calls and a massive set of development tools and libraries. Resources: The C Programming Language, clang(1), clang-local(1). OpenBSD's home-grown web server. If you need more features for your web application, submit a patch. Resources: httpd(8), httpd.conf(5), slowcgi(8), Relayd and Httpd Mastery. SQLite is a self-contained, embeddable, zero-configuration database. It's a practical solution for the majority of database needs. Resources: API reference, SQL reference, The Definitive Guide to SQLite. BCHS is a stable, developer-oriented platform. Get used to minimalism and security: componentised, privilege-separated binaries in file-system jails. Most of all, forget your instincts to search Google and StackExchange for every parameter and function call: man pages are your new best friend. have more links? let us know. Software development is full of jokes. This is not one of them. How do I pronounce BCHS ? It's pronounced /biːtʃəz/, beaches. Or just Bee See Aich Ess. How can I hire BCHS developers? Wasn't this site once funnier? Yes. But some folks confused humour with levity. 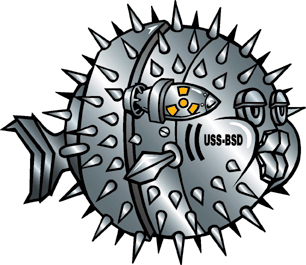 OpenBSD puffy logo copyright Theo deRaadt. Source. SQLite logo released by Dr Richard Hipp into the public domain.